closed van Ζ14 (by OSE). 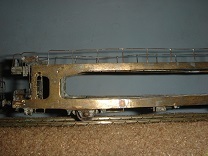 From the pictures, where the brake-system is shown, the type is: KE-GP (1955 - Knorr-Bremse mit Einheitsbauart (KE) für Personen- und Güterzüge, that is used on both passenger and freight wagons of Epoche III, IV, V,http://de.wikipedia.org/wiki/Knorr-Bremse). Last edited by Dimitris on Fri Dec 13, 2013 9:11 pm, edited 1 time in total. I love the detailed shots, Dimitris. Thanks. 29.09.2013 Aigio railway station. Ζ14 15071. Also, some explanations of how the brake-system works, summarised. Brake-cylinder + Horizontal-balancers. The air-cylinder takes the air - already didstributed by the ditributor from the air-reservoir (when wagon is stable) / and or by the air-brake pipes from the other rolling-stock / and or locomotive, and moves the rods (Bremsgestänge), which their ends press the vertical balancers (above the axle of the wheelset) that press the brakes on the wheel-rim. Τhe air-reservoir stores the air, such as to be used by the distributor, when the wagon is stable. Τhe distributor "does the job' that is above-mentioned, and is connected withe brake-releaser, so as the brakes may be released manually, in cases of need / and or shunting. a. The one that controls how much Air is needed for braking, i.e. more, when wagon is connected to passenger trains - as the speeed is high, and less, when wagon is connected for freight trains - as the speed is low. b. The one that controls, when is needed the Air-reservoir to be empty (leer) or full (beladen). The hand-brake, releases the brakes, during shunting-operations. Last edited by Dimitris on Fri Dec 13, 2013 9:17 pm, edited 4 times in total. I have a passion on rolling-stock and railway-tracks, to take very detailed if possible - photos. Z14 15137 - 15150 ( 1990-1991 ) with braking hut. Thanx for the correction, Jason. I just needed to know exactly the operation-numbers / Betriebsnummer. Z14 15051 is now in Pyrgos Engine Shed in good condition.